I've got a lot of things going on with today's card, I had started working on the focal image for this card last night - then got sidetracked. My oldest is off school today as the upperclassmen have testing. He's excited to be off today, as he came home yesterday with his Driver's Permit, DH did go out with him for a bit yesterday, he's going to drive with him for a few weeks before I do. Remember when you got your permit? Gosh, for me it seems like so long ago! I used today's SCS Sketch for my inspiration, rotating it for a different look. I stamped my image from Bloomin' Beautiful in Black on watercolor paper. Stamped the image again on Eclipse Tape and made a reverse mask. 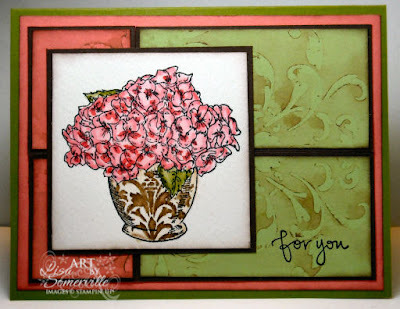 I placed the mask over my image, colored the vase with Creamy Caramel, and stamped the Damask from Friends 24-7 ink Close to Cocoa, then ran my Aquapainter over the stamped image to wash it out a bit. The flowers are colored using the Marker Watercolor Technique. I cut my panels for the background, adhered them to my scrap paper, then using the Kind Thoughts Flourish, applied the Wet Stencil Technique, once dry I sponged the edges in Chocolate Chip, and layered on my Chocolate panels. The sentiment from Great Friends is stamped in Black. Thanks for stopping by - hope you have a wonderful day! Gasp! This is dazzling!!! love the celery and coral together! sooooooooooo pretty! Lisa I love this card! I just ordered the sweet pea stamp a couple of days ago. Your background is stunning! Can you imagine that on a wall? Thank you for sharing your talent with us! This is so beautiful, Lisa!! Love what you did with the vase! Wow! !